OTech: 2012 SIIM Conference message: Why is PACS not smarter? 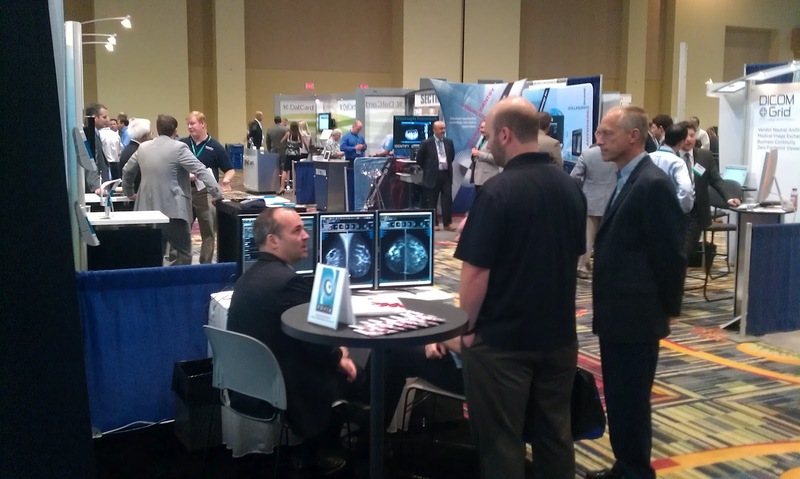 2012 SIIM Conference message: Why is PACS not smarter? The major question posed during the keynote speech at the annual PACS conference in Orlando, Florida this past week was, “Why are PACS systems not smarter?” Dr. Eliot Siegel from the VA in Maryland says there is a big need for applying artificial intelligence or AI to the use of workstations, to allow the radiologist to become at least twice as efficient and have more clinical context information available at his or her fingertips. Vendors should start thinking “out-of-the-box” and apply technologies, which are commonly used in other applications and practices. Currently there is only one-way communication between an acquisition device, which sends images to a PACS system, which are then reviewed and reported on, and then sent to an EMR. Siegel says that there should be a bidirectional exchange between the PACS, EMR and modality. The EMR should share pertinent other clinical information with the radiologist, who should be able to feedback information to the PACS and modality. For example, if a certain X-ray exposure was not optimal with regard to noise, presentation, image processing, or even the contrast agent used, that information could be fed back to that modality to optimize future imaging. Most EMR systems are merely a direct representation of a paper record in an electronic format and do not necessarily have a lot of structured text, which makes it hard to extract important information. As an example, a physician might need to browse a complete lab report to find one particular value such as the creatinine level, which could be important for the procedure to be scheduled. In addition, instead of a block of text, a patient history could be represented in a picture of the patient with specific issues highlighted that can then be used to drill down for specific details. Image processing and/or CAD analysis could be based on patient medical history and genetic information. As several other speakers mentioned, the ideal viewer is the so-called “zero-footprint” viewer. This is a new term for “thin client,” which basically means that the image handling and processing is done at a server, whether it is a local PACS, an enterprise server (also referred to as VNA), or a cloud storage device. When a user exits the viewer, there is no “footprint” left, no local images or any trace of the software, which is also good for security reasons. One of the features could also be the display of reference papers and resources, which would include a direct link to one or more images that can be opened from the teaching file directly in the same zero footprint viewer to demonstrate a particular finding. With regard to peripherals, a lot can be done to improve these. For example, new technologies used in gaming could reduce the risk of wrist and/or hand injuries to radiologists due to over-use of a mouse and keyboard. These input devices and the graphical user interface are “ancient” in comparison with the technologies used in the gaming industry or provided by search engines. Images are displayed in a linear, one-dimensional format, instead of, for example, using a “Google earth” user interface. There are devices that can interpret “thoughts” and allow a physician to command simple image manipulations such as scrolling through an image series, or adapt the Xbox Kinect user interface to manipulate images. Hanging protocols traditionally have been the weak point for any PACS viewing station. The image presentations, sorting and ordering could be much improved by applying some of the intelligence matching the radiologist’s preferences. It was very refreshing to have visionaries such as Dr. Siegel telling the audience in blunt language what he thought of the state-of-of-the-art of PACS technology, and point out what is lacking and what the technology could be. There is a lot of technology out there, it is just a matter of vendors implementing the technology to allow these systems to become more efficient and provide better, more pertinent clinical information to improve patient care. PACS comnference message has been shared by this blog. This is really a uniwque and productive blog. Such types of blogs are also helpful in the study of check out cheap essay writing services. The quality of this blog would be understood after reading this blog untill end. This is perfectly a good blog for the readers.